So you’re planning a visit los Arrayanes National Park? Awesome stuff. It’s a seriously beautiful part of Argentina and Neuquén province. 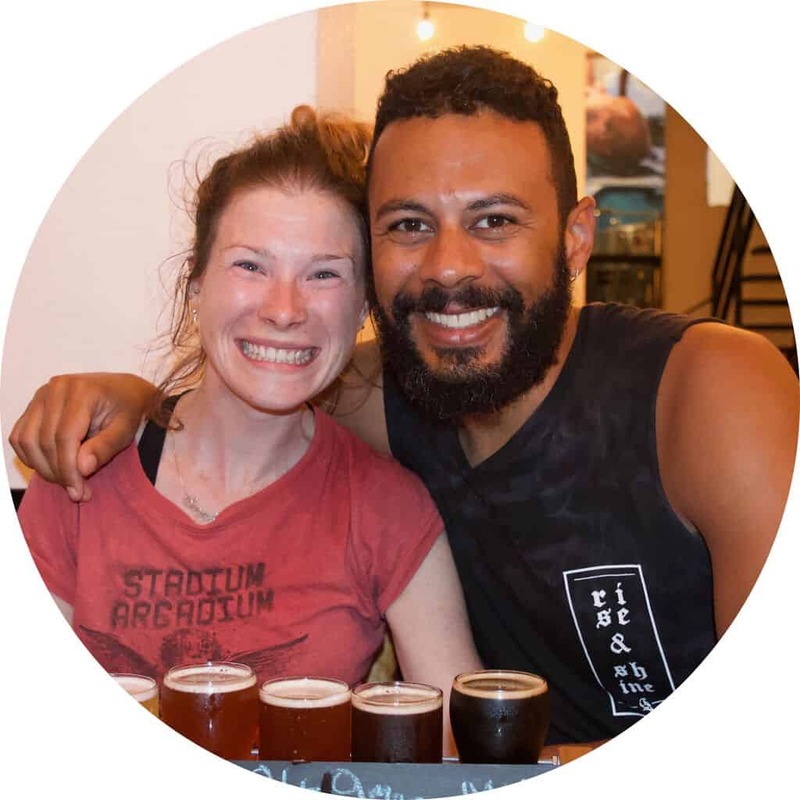 In this guide we’re going to give you all the information you need to plan your trip, including the various routes to get there, how much it costs and what you should take with you. First a little history about los Arrayanes. 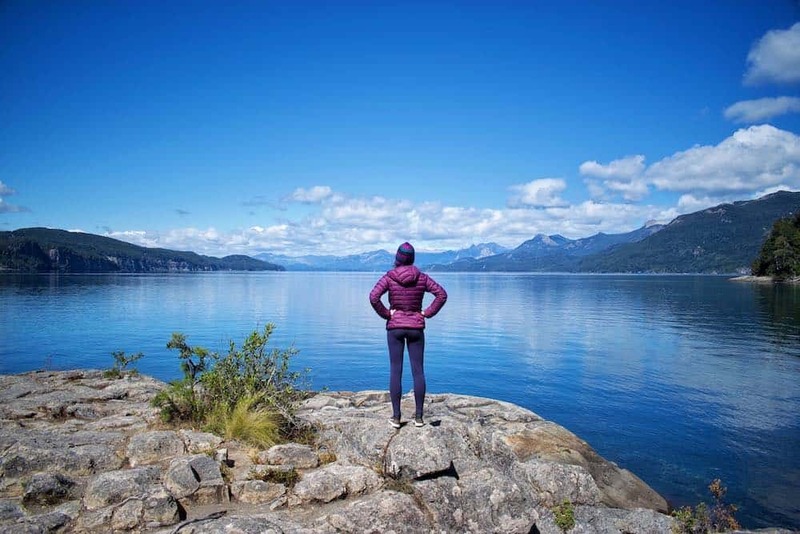 Until 1971, it used to just be part of the larger Nahuel Huapi National Park. 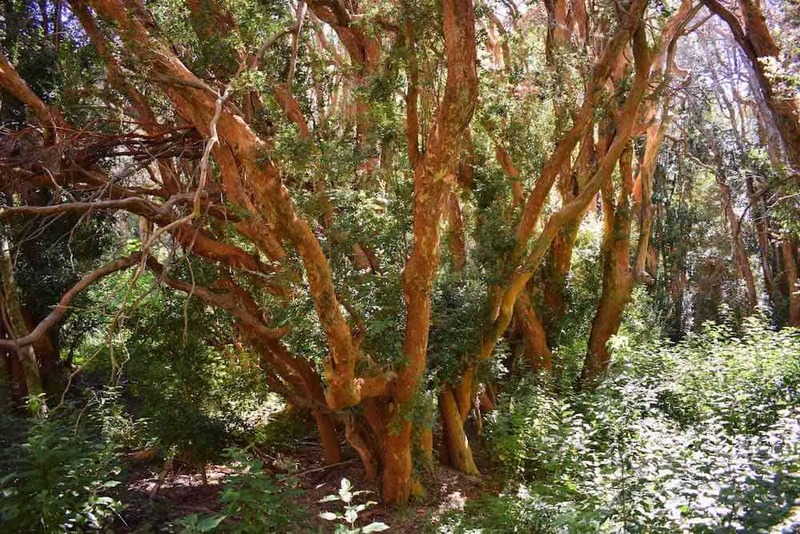 But it was made an independent National Park for the purpose of the preservation of unique Arrayanes forest. 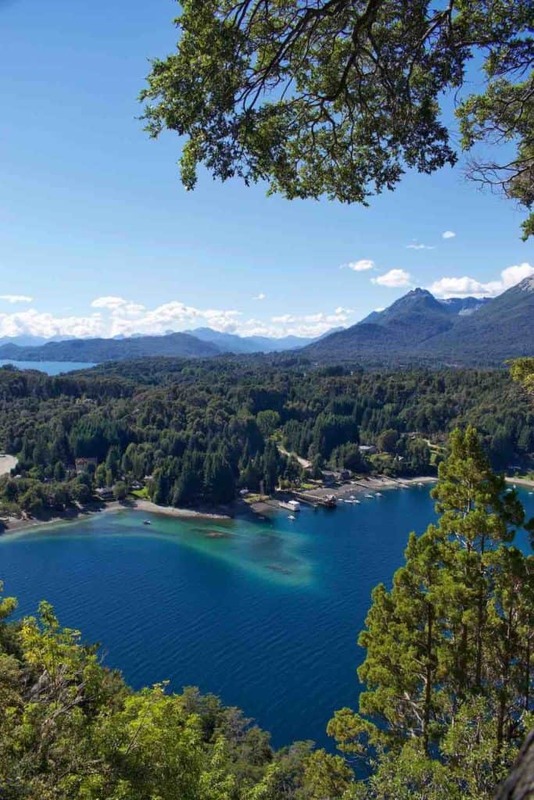 Located in an extreme of Lake Nahuel Huapi, right on the tip of the peninsula that is Parque Nacional Los Arrayanes, it is one of a kind in the world. Although it was actually artificially created by previous landowners who removed all other vegetation to promote its growth. The cinnamon stick like trees are rumored to be where Walt Disney drew inspiration for the film, Bambi. Unfortunately it is just that, a rumor. But while it has been confirmed that Walt didn’t actually visit the Arrayanes wood, it still takes on a magical and mystical feel. 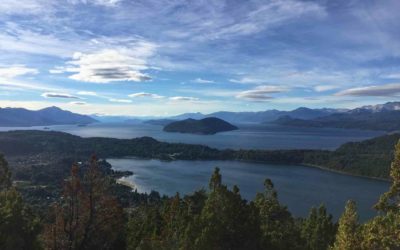 Unless you are staying in Villa la Angostura, chances are that you will visiting los Arrayanes National Park on a day trip from Bariloche. 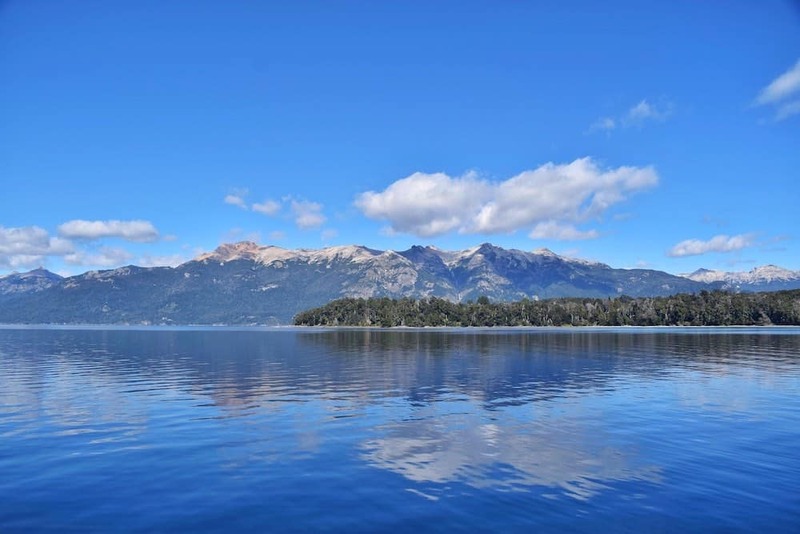 So let’s cover how to get from Bariloche to Villa La Angostura first – obviously step ahead if you are already there. There are 8 buses per day running from Bariloche to Villa la Angostura, with the first one 8am. This is the one that we took and would recommend because the next one isn’t until 9:45am. The price is $165 ARS (£3 GBP / $4 USD). The bus company is Via Bariloche. 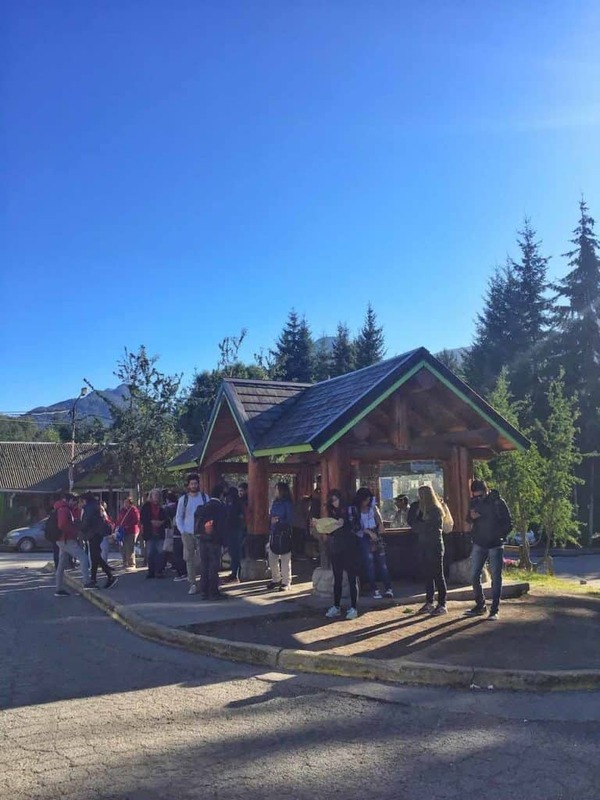 You can buy tickets to get to Villa Angostura from Bariloche either in the town centre or at the bus terminal. The ticket office address in town is Mitre, 321. It’s right on the main street and easy to find. You’ll need your passport details and can pay in cash or card. It’s best to book a few days in advance, especially in high season. 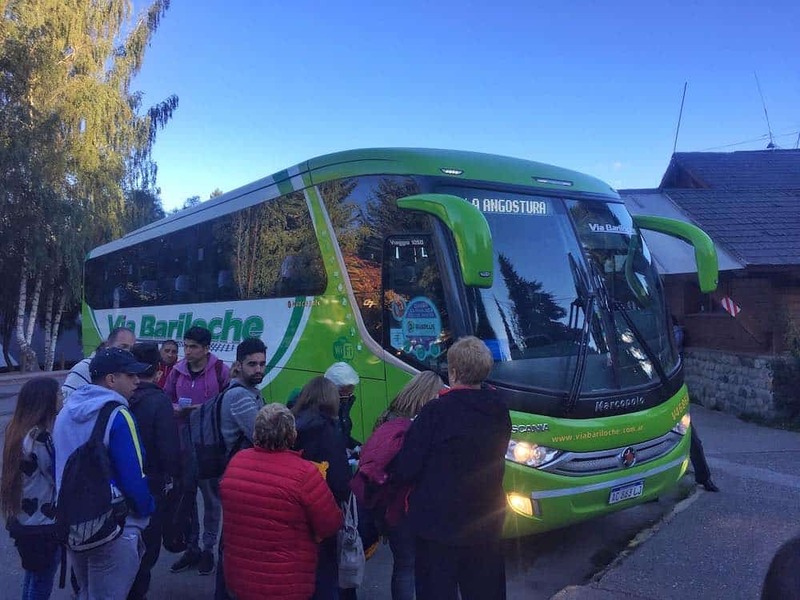 On your day of travel the bus from Bariloche to Villa la Angostura leaves from the bus terminal. The number 20 and 21 local buses go through centro to the bus terminal around every 20 minutes. 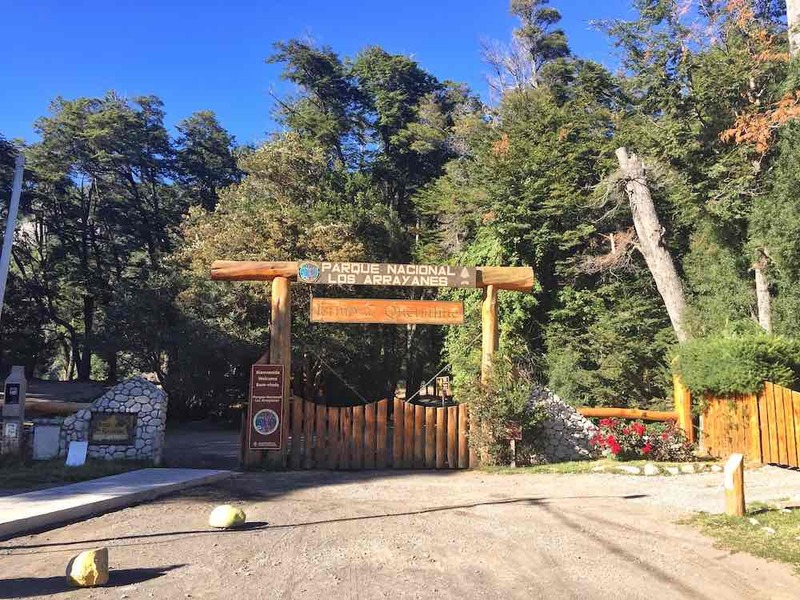 There’s a stop right outside the Intendencia Parque Nacional Nahuel Huapi (San Martin, 24) and it’s around a 10 minute ride. The journey from the bus terminal in Bariloche to Villa la Angostura takes around 1 hour 15 minutes. Don’t forget your passport, they will need to be checked against your tickets. For the way back we booked the 7pm bus from Villa la Angostura to Bariloche. The one before is 4.30pm so it makes the day trip pretty tight time wise. You would need to take the boat roundtrip as you wouldn’t really have enough time to comfortably walk or hike the route, even one way. Villa la Angostura is a cute little town too. So we were glad we had a little time to explore it at the end of the day. 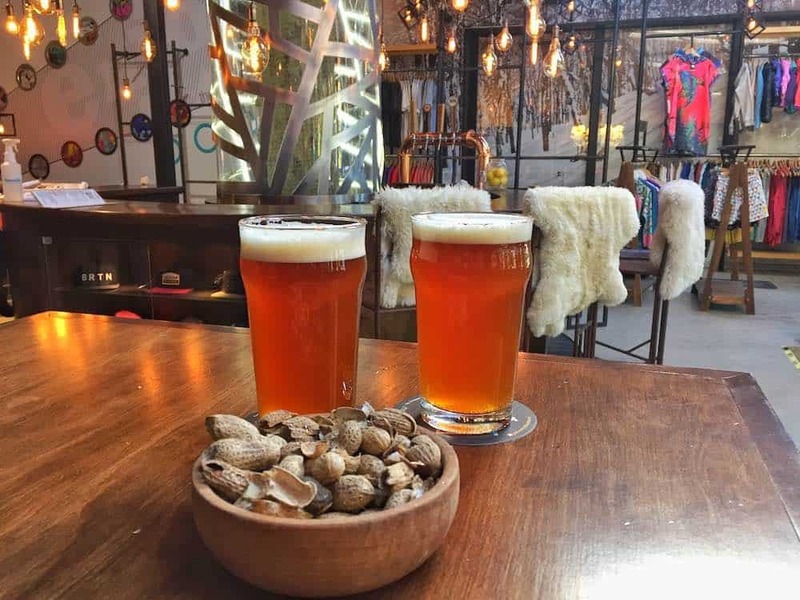 And there’s a few nice bars where you can grab a happy hour beer before jumping on the bus back to Bariloche, which we were only too happy to do. 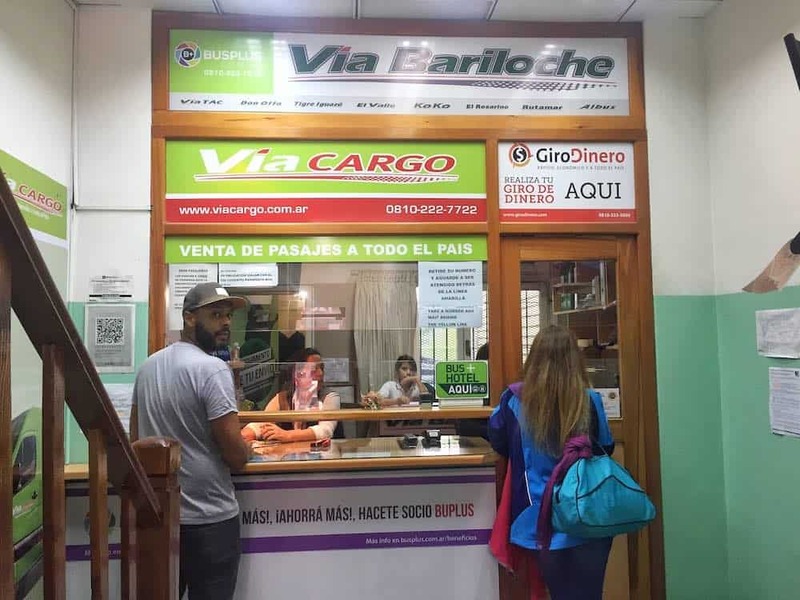 Once you arrive in Villa la Angostura bus terminal, walk back onto the main road to the Tourist Information Office – it’s like 2 minutes away. 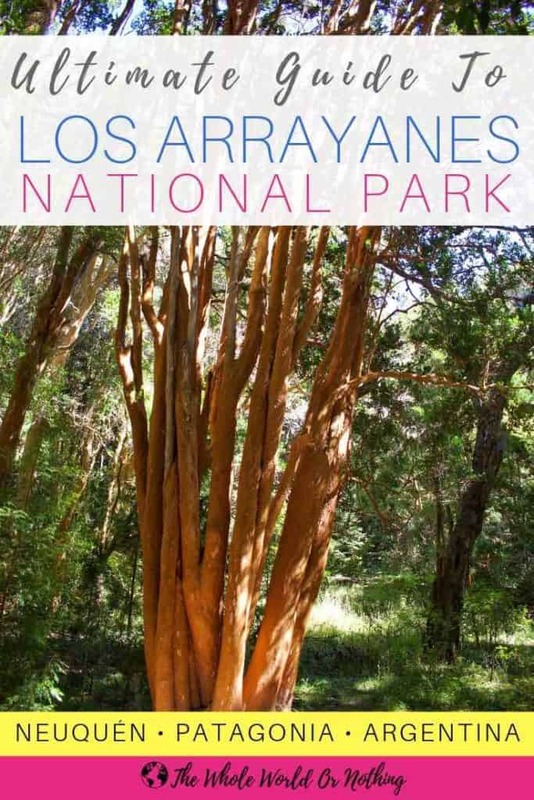 Here you can get a map for Los Arrayanes National Park, a boat schedule and a local bus timetable. 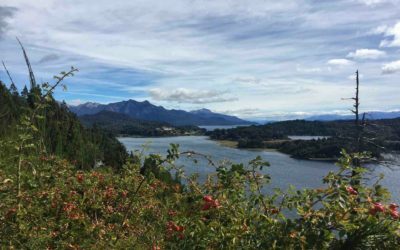 To get from Villa la Angostura to the entrance of Los Arrayanes National Park you can then either walk the 3km or take a local bus. They aren’t that regular, so depending on when you arrive it may be quicker for you walk for 20 minutes than wait. This is what the bus stop looks like. 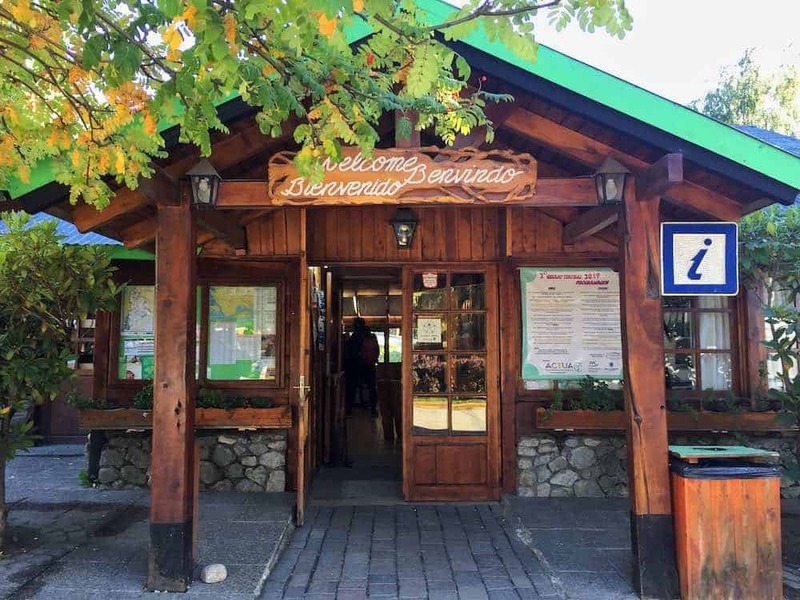 If you take the 8am bus to Villa la Angostura from Bariloche, as we did, you will comfortably have enough time to get your map and timetables from the Tourist Information Centre and jump on the 10am local bus to Puerto Villa. Note, NOT Puerto Manzana. Unlike on the local buses in Bariloche where you have to use a Sube card, it is cash only on the local buses in Villa la Angostura. The fare, one way, is $50 ARS (£1 GBP / £1.25 USD) and the drivers give change – within reason. The journey takes around 5 minutes and there are just two stops. The first is at Bahia Mansa. This is the dock where you take the catamaran boat along the bay route to the end of the Los Arrayanes National Park peninsula. The second and last is at the entrance to Parque Nacional los Arrayanes and the Bahia Brava dock. This is where you take the catamaran boat along the alternative mountain route. Don’t worry if you get off at the wrong one. It’s a few minutes walk inbetween. 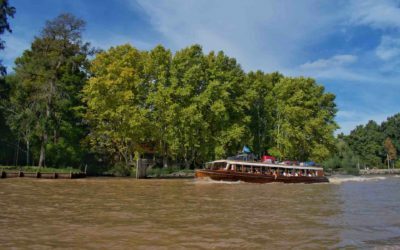 One of the most popular ways to visit the Arrayanes forest or Bosque de Arrayanes is by boat. The views are spectacular. There are catamarans running each way around the Parque Nacional los Arrayanes peninsula which will give you either bay or mountain views. As already mentioned, the catamaran for the route along the bay leaves from Bahia Mansa, or Mansa Bay in English. 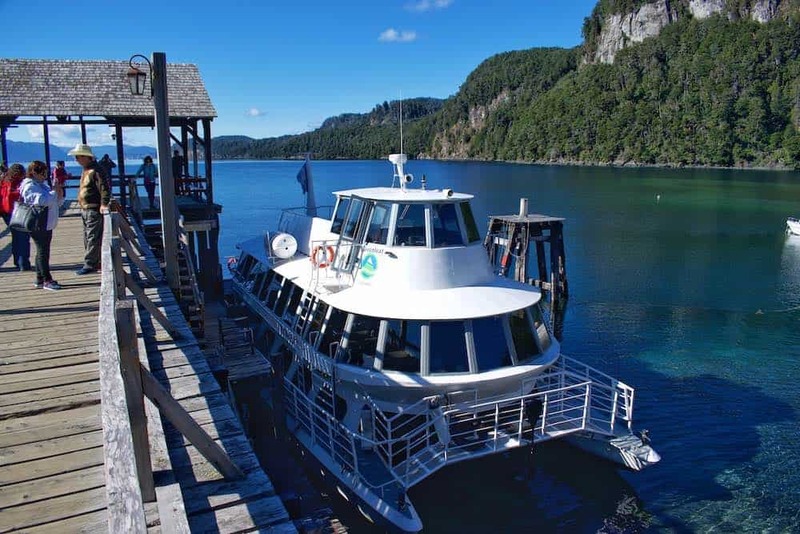 The company is called Catamarán Futaleufú and there are two trips per day. The first leaves at 11am and returns at 1pm. The second leaves at 2.30pm, returning at 4.30pm. The cost one way is $800 ARS (£15 GBP / $21 USD) per person or $1100 ARS (£21 GBP / $28 USD) for a round trip. For the mountain route the catamaran leaves from Bahia Brava, or Brava Bay in English. 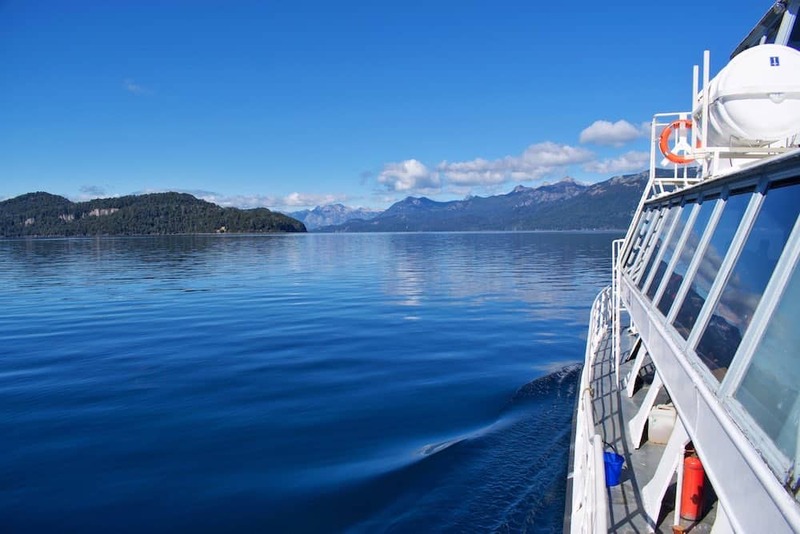 The company running this service is called Catamarán Patagonia Argentina. There are also two trips per day. The first leaves at 12pm and returns at 2.15pm. The second leaves at 3.15pm, returning at 5.30pm. The cost is slightly cheaper at $700 ARS (£13 GBP / $18 USD) one way and $1000 ARS (£19 GBP / $25 USD) for a round trip. You can pay by cash or card. The sailing time to get from the base of the peninsula to Puerto Quetrihue and the Bosque de Arrayanes at the tip is around 1 hour. So just bear in mind that if you opt for a roundtrip, you will only have an hour to explore the Arrayanes forest before needing to be back on the boat. There’s lots of information given out aboard the catamaran about los Arrayanes National Park and the history of the area. However it is only in Spanish. When you dock in Puerto Quetrihue you can choose to either walk around with the guide from the boat or go off on your own. What we opted to do was take the 11am bay route catamaran from Mansa Bay, one way to the peninsula tip. Then hike back along the 12km trail through los Arrayanes National Park – more on that in a bit. But that way we got to spend as long as we wanted with the trees. You can also do this the other way round. Making your own way along the peninsula through los Arrayanes National Park, then returning to the base by catamaran. Obviously you need to time this so that you have enough time to explore the Arrayanes forest and make the boat. If you choose this option, it is best to buy your catamaran ticket before you enter los Arrayanes National Park to guarantee you have a spot on the return trip. If you do decide to do it last minute, we saw you could buy catamaran tickets in the tea house. 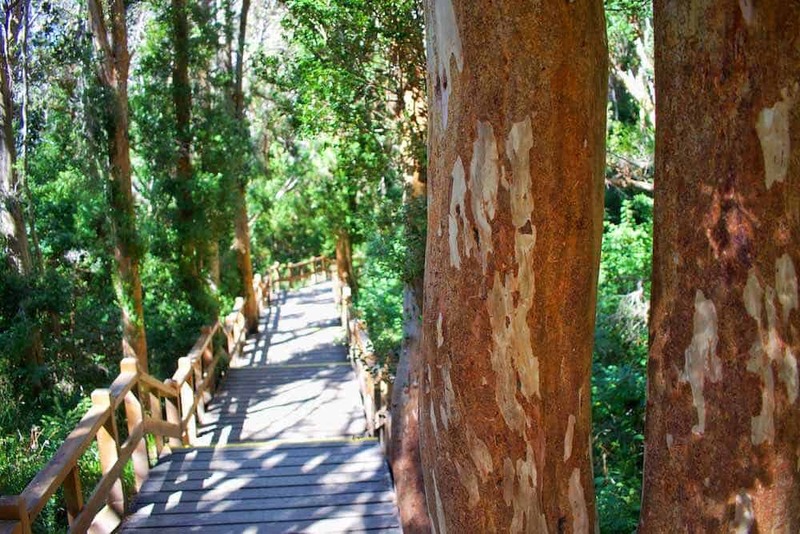 The trail through los Arrayanes National Park is 12 km one way with the last kilometer at the end of the peninsula being a wooden walkway around the Arrayanes forest. It’s an easy route along a dirt path with undulations rather than huge slopes up down. It’s also just one path, so it’s impossible to get lost. If you do, I’m not sure you should be leaving the house. For the most part it’s shaded as you’re literally walking through a huge forest. There’s no water sources until you get to the lagoon at the end so take enough. It’s totally possible to walk the whole 23 km in one day if you wish and are fit enough. It’s also the cheapest option. But you are effectively walking the same route twice. As I say, we took the catamaran there and walked back, which we would definitely recommend. We arrived at 12pm and ate lunch on the shore of the lagoon, then wandered around the Arrayanes trees at our leisure. Setting off hiking back through los Arrayanes National Park at at 1:45pm. Including venturing off the main path to the two viewpoints, Mirador Bahia Mansa and Mirador Brazo Norte, it took us just over 3 hours to hike back along the peninsula. We got back to the start with plenty of time to take the 5:35pm local bus back into Villa la Angostura. If you are walking the whole 23km route there and back along los Arrayanes National Park, I’d recommend allowing a minimum of 8 hours. 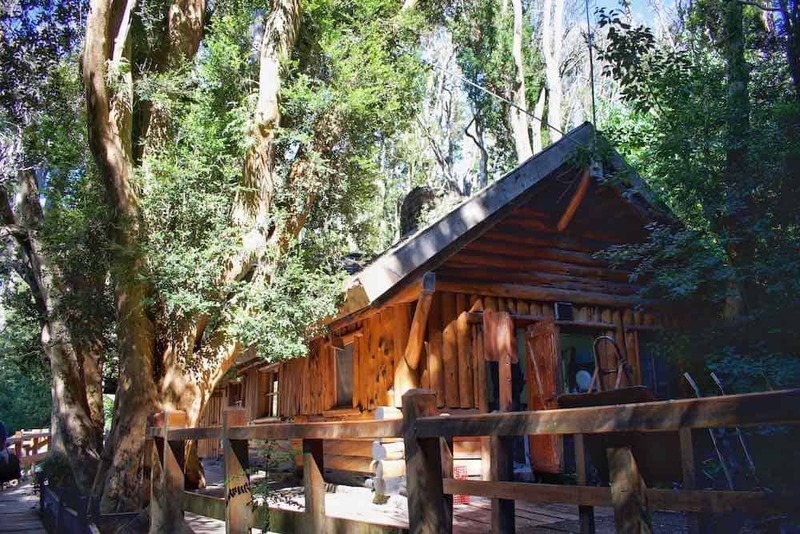 So that you have time for breaks and to enjoy the Bosque de Arrayanes at the end. 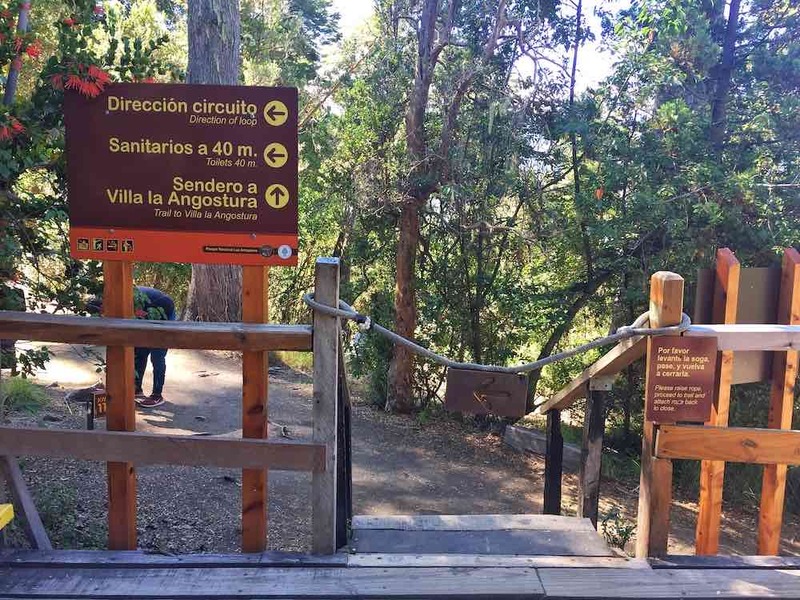 If you are getting the boat to Bosque de Arrayanes and cycling back through los Arrayanes National Park, it’s not so easy to find where the trail starts. We walked right past it the first time. It is marked Villa trail but you’ll need to dip under a rope to get off the wooden circuit. 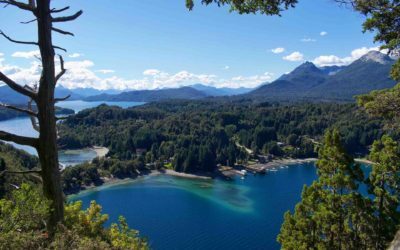 At the end you can drop down onto one of the Nahuel Huapi Lagoon beaches at either side and even take a swim if you like. The water is chilly, even at the height of summer, but great for cooling off after a long hike. 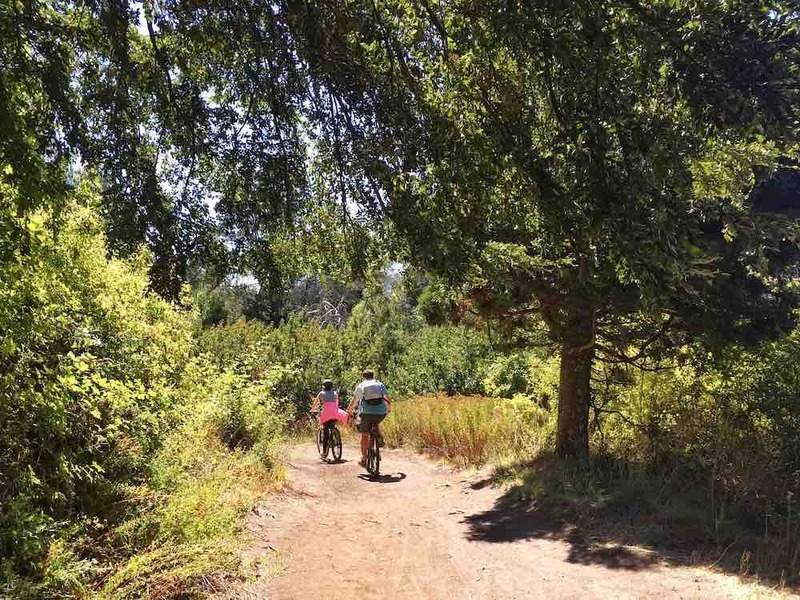 An alternative option is to rent a bike and cycle the route through los Arrayanes National Park to the Arrayanes forest. 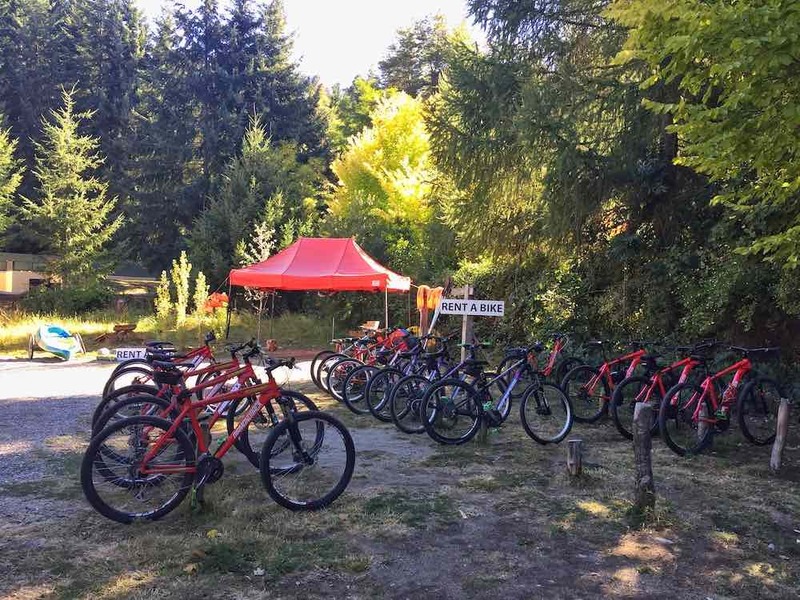 There’s plenty of rental shops either in Villa la Angostura (in which case you can just bike the 3 km to the park entrance), or around that start of the trail head. We checked prices for some available near the entrance to los Arrayanes National Park. They were $500 ARS each for the day, 9:30am – 8pm. This included a helmet, a lock, and a bike pump. You need to leave some ID with them as a deposit. It’s possible to rent kayaks too. You can take bikes onto the catamarans too, so in case you wanted to go one way by boat and the other cycling that is totally possible too. But you can’t take bikes onto the wooden walkway around the Arrayanes forest. There’s a bike park to leave them at. If going on the boat and biking back, you’ll need to walk them around to the right off the pier and along the beach to the bike park. Just a note about the route along the peninsula for bikes. There are quite a few steps in parts so you will need to get off and walk in places. 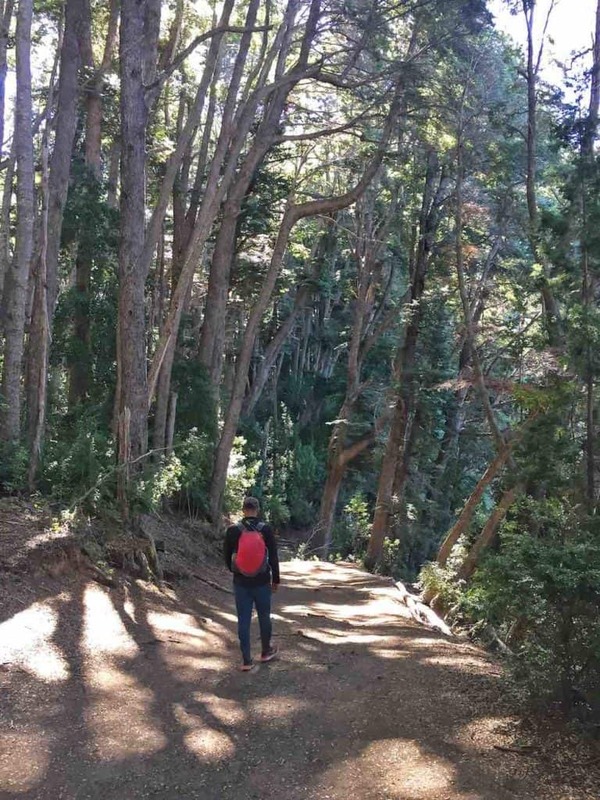 Regardless of how you get to the end of the peninsula and bosque de arrayanes, you will need to buy a seperate ticket to los Arrayanes National Park. You can buy these from multiples places near the catamaran ticket places and just inside the entrance to the park. The cost is $350 ARS (£7 GBP / $9 USD) each per day and you can pay by cash or card. If taking the boat, they will check you have them as you are boarding the respective catamaran. 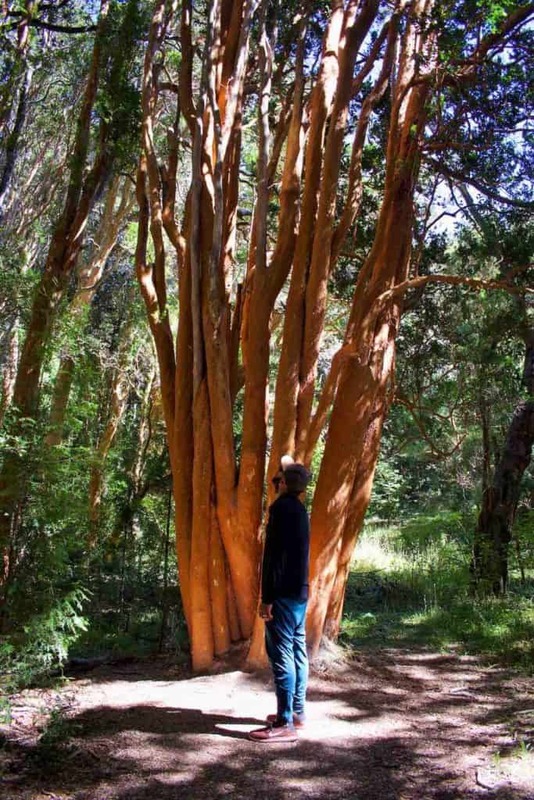 The main point of visiting the Arrayanes forest is obviously for the trees. 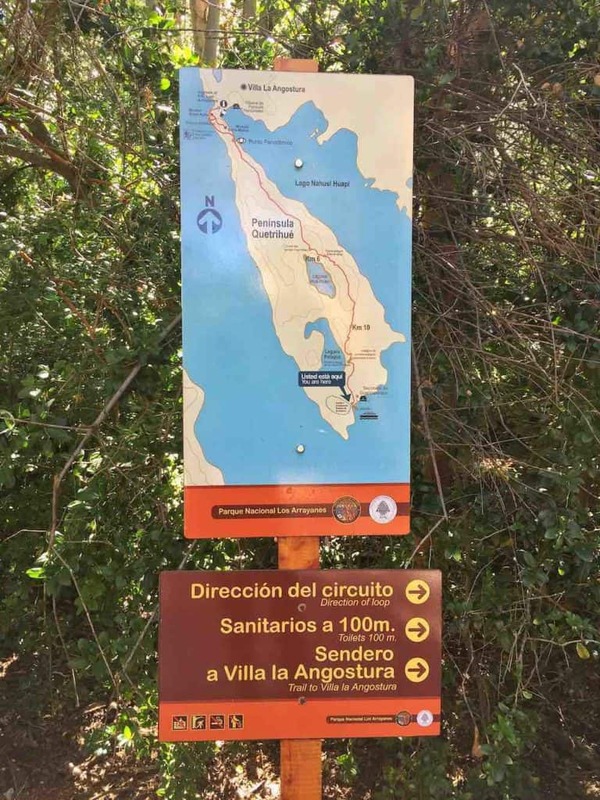 In case you are on the boat tour and don’t understand Spanish, or simply want to explore on your own, there are a few information boards dotted around in both Spanish and English. But there is also a cute tea house selling hot drinks, cakes and snacks. The prices were reasonable at $140 ARG (£2.60 GBP / $3.50 USD) for a coffee and a muffin. 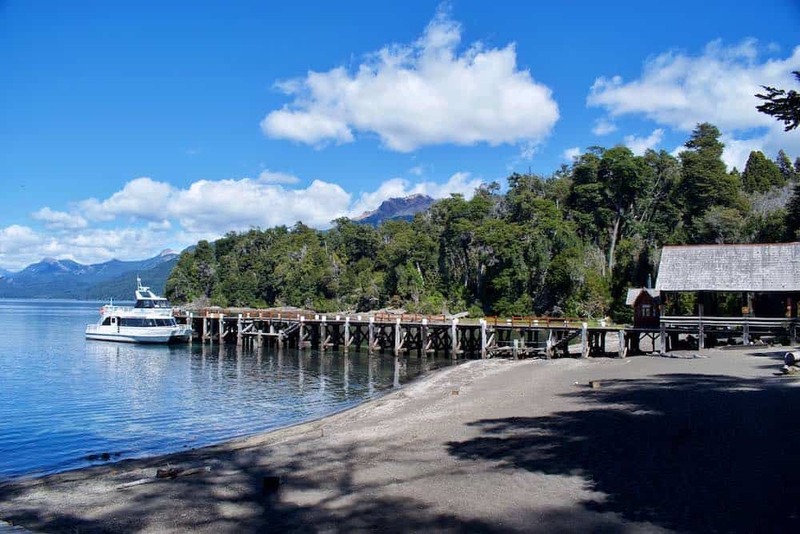 You can also chill out on the shore of the Nahuel Huapi Lagoon, or on the piers, and take in the views. There are public toilets. We visited Parque Nacional los Arrayanes at the beginning of March and the weather we had was great. Really sunny, but still pretty cool. Here’s what we’d recommend wearing and taking with you on your trip. Obviously check the weather and if there’s no rain forecast don’t bother with the rain gear. We hope you have an awesome trip. 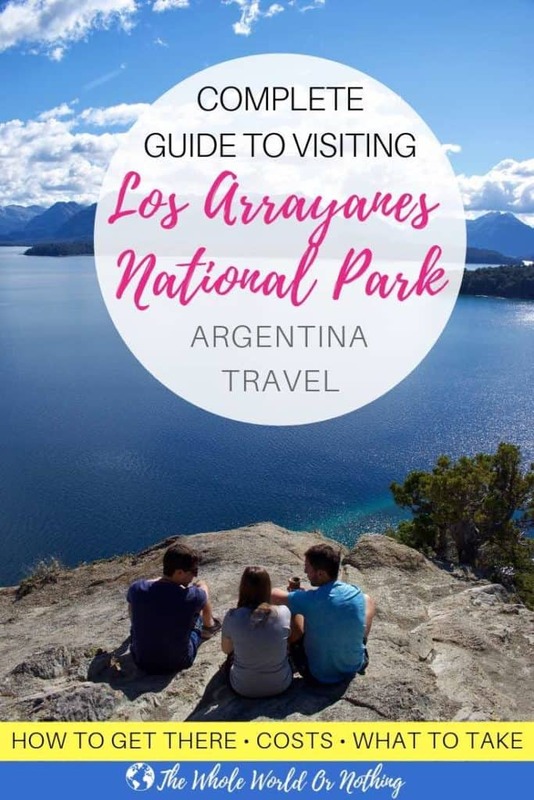 Visiting los Arrayanes National Park was one of our favourite things that we did in Patagonia. If there’s any more information you need, drop us a comment and we’ll do our best to help. We never go anywhere without travel insurance – and neither should you. This particularly goes if you’re planning to do any of the more adventurous activities above.